After two doctor visits yesterday, I have a sobering, realistic assessment of where I stand. This isn’t going to be a miraculous sprint to a triumphant recovery. Rather, it will be a long, uncertain, prayer-filled crawl to recovery. My surgeon says I will need at least one more surgery to get my face right, possibly more. My lower eyelid, at least, isn’t going to make it intact. I hadn’t understood that my “soft food” diet instructions were not just about comfort: the bone above my teeth on the left side is fractured, so I can’t be applying any pressure there. I really did a number on my face; I’m lucky the surgeon was able to piece it together as well as he has. There is damage to at least one of the nerves to my face. This morning, though, I am able to report that the damage isn’t permanent! I woke up with diminishing numbness where there had been no feeling at all! It will be these tiny shifts that will mark the path to recovery. My retina is still obscured by hemorrhaging inside the eyeball, and there appears to be hemorrhaging beneath the retina as well. It will likely be weeks of waiting and watching before we can know what’s what. My approach is going to be cellular: focus on every little cell getting healed and building from there. On the plus side, my Halloween costume this year ought to win some awards! I heard the wood give, and then I felt a blow to my face. I stepped back off of my platform and dropped to my knees. I could feel blood begin to flow from my face. I was extremely dizzy and felt I might pass out. I pulled my respirator mask off and dropped it, then stood up. I looked at the garage door and assessed the likelihood of my reaching it and wresting it open as poor. I took a few steps to my tool chest, turned off the radio, and groped for the telephone. I took the few steps back to my original spot and collapsed back to my knees. I felt strongly that I might pass out. If I called 911 and passed out, EMS would have difficulty locating me and getting in to me. My partner works a mile away. I dialed her number, and to the woman who answered, I said very clearly and forcefully, “Tell Karen to come home right now,” and hung up. I stayed down for a moment trying to collect myself. I saw my glasses lying next to where I had dropped my respirator. I picked them up and stood up, made my way to the doorway, turned out the lights, locked the door, and crossed the back porch to the kitchen door. I stopped there, turned around, and went back to make sure I had locked my studio door. As I was walking back I noticed blood drops on the porch floor, so I picked up the end of my apron to catch the blood as I entered the kitchen. I locked the kitchen door behind me, walked to the refrigerator, and grabbed a dish towel, holding it to my face, still clutching the end of my apron. I passed into the living room, picked up my purse with my identification, and went out the front door. I had just turned to lock the front door when Karen pulled into the driveway. I walked to the passenger side, opened the door and got in, and told Karen to go lock the front door, which I had to repeat, because she didn’t understand. She did so, got back in, backed out, and drove. I did not attempt to buckle my seatbelt. I collapsed into a huddle in the seat, clutching the door arm rest to keep my balance as we drove. I could hear Karen asking me or debating herself which hospital to go to. I couldn’t answer. Karen thought that I had passed out. I heard us pull in, heard her leave to get help. Someone opened the car door, and people helped me into a wheelchair. Total elapsed time: seven or eight minutes. I had a terrible accident with my lathe last Friday afternoon, September 21. A large (10-inch-diameter), heavy, partially hollowed mesquite vessel came apart while rotating at about 1200 rpm (too fast, I know). I knew the wood was cracked, and I had wrapped the outside with duct tape, but apparently not enough to hold it together. I didn’t even get a catch, wasn’t even touching a tool to the wood: the crack just gave. The vessel broke into three pieces; I think one piece split when it hit the wall. The piece that hit me weighs a little over a kilogram. I had removed my faceshield, so only my half-mask respirator and glasses (with polycarbonate lenses) were between me and the wood. Pretty much all of the bones in the left half of my face were fractured. My jaw doesn’t seem to have been injured. My eyeball did not rupture. Surgery the following day repaired the bone damage. I lucked out in having as a surgeon one of the doctors who pieced Gabrielle Gifford’s eye orbit back together. He used four titanium plates to reconstruct my face, and he also stitched my eyelids back together. I’m told I look “100% better” than before the surgery, so he did a great job. And he did the surgery through the roof of my mouth, so there won’t be any scarring apart from my eyelids. Remarkable! The ophthamologist who saw me presurgery and two days after was astonished at how good I looked. He had expected me to be swollen to the size of a watermelon, based on my presurgery state. I can talk and eat soft food with small bites, and my energy level is good and improving daily. I’ve since learned that the lens in my left eye has been displaced, which will require surgery to correct. The real question is whether the retina and optic nerve are damaged, for concussive damage to them would not be reparable. There is still too much blood in the eye to see what’s going on, so it may be a few weeks before I know if my vision can be restored. I am hopeful, because when the accident first happened, I couldn’t see anything. After the surgery, I could see some light, and by the next day, I could detect motion as well, with a black hole in the center of everything; that’s the holding status of my vision for now. So, please, concentrate any positive thoughts you want to send me on my having an attached, intact retina and healthy optic nerve; this will offer me the best chance at full recovery. Thank you so much for your prayers and positive wishes. Your individual and collective support means so much to me. I have high hopes for full recovery, thanks to all your good wishes. 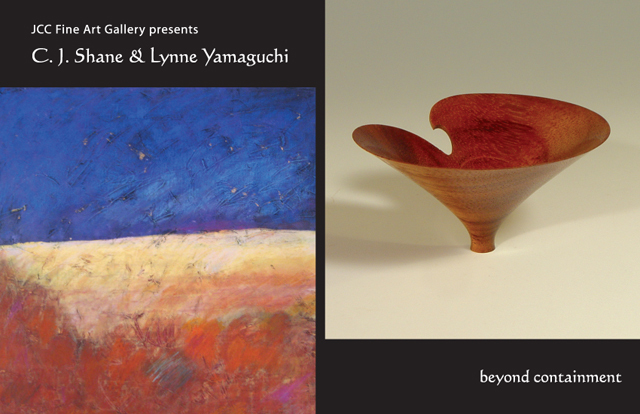 “Beyond Containment,” an art exhibit of paintings and sculptural turned wood vessels, will open February 2, 2012, with a reception from 5 to 7 p.m., at the Tucson Jewish Community Center (JCC) Fine Art Gallery in Tucson. The exhibit will be up through March 13, 2012. Yamaguchi exhibits locally and nationally. She most recently exhibited her elegant wooden vessels at the Shemer Art Center in Phoenix. You can see more of her work at www.lynneyamaguchi.com. C. J. Shane is best known for her oil paintings and monotypes. Her color- and texture-intense abstracted landscapes are deeply informed by the Sonoran desert landscape. To Shane, “Beyond Containment” refers to her experience of the natural world. “My hope is that the viewer of my art will be reminded of the serenity and depth to be found in the natural world.” Shane exhibits locally and nationally. Her work can be seen at www.cjshane.com. “Beyond Containment” will be up through March 13, 2012. 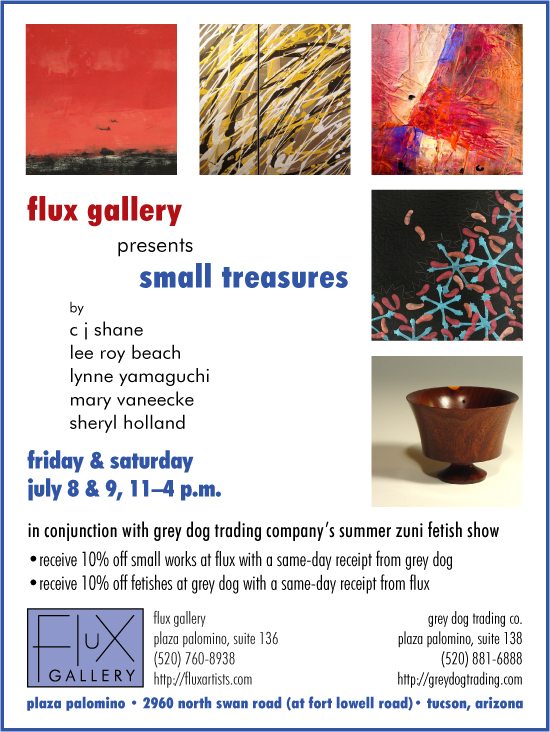 Gallery hours are Monday to Thursday, 9 a.m. to 9 p.m., and Sunday and Friday, 9 a.m. to 6 p.m. The center is closed on Saturdays. 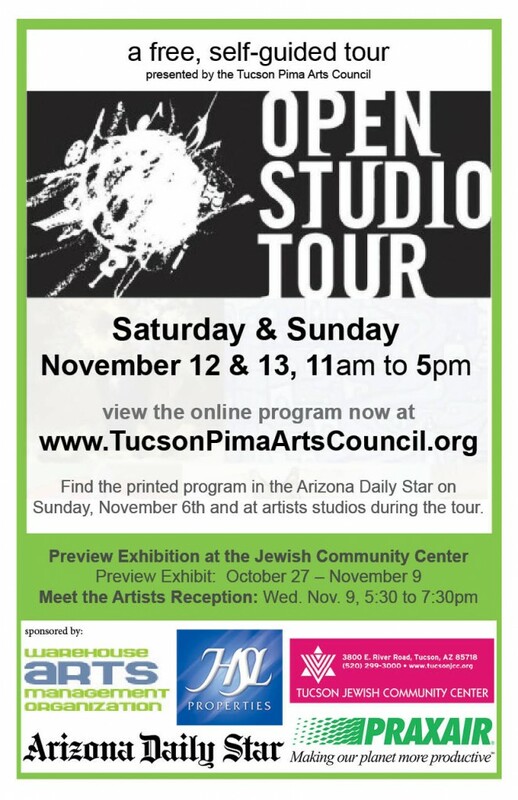 The Tucson Jewish Community Center is located at 3800 E. River Road, Tucson, AZ. This month, I have 12 pieces in the 1st annual “Home for the Holidays” invitational show at the Shemer Art Center and Museum, located at 5005 E. Camelback Rd. in Phoenix. The show features work from selected Arizona artists and runs from December 2 to 31, with an opening party Thursday, December 1, at which I will be one of the artists in attendance. If you are looking for unique, one of a kind, hand-crafted gifts to send to your family and special friends this holiday season look no more! 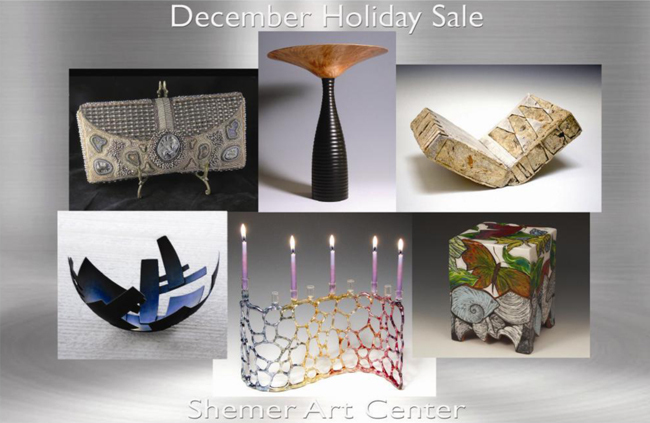 The Shemer Art Center presents its 1st Annual Invitational Home For The Holidays Show & Sale, December 2–31, 2011. The exhibit features high-quality work from 35 talented Arizona artists working in metal, clay, glass, beadwork, wood, paper, textiles, print and other diverse disciplines that will be for sale during the month of December. AND … if you would like to be one of the first 100 VIPs (Very Interested Patrons) to get a sneak preview (1st chance to buy), a Holiday Party is scheduled for Thursday evening, December 1, 2011, from 6 to 9 p.m. Artists will be in attendance! 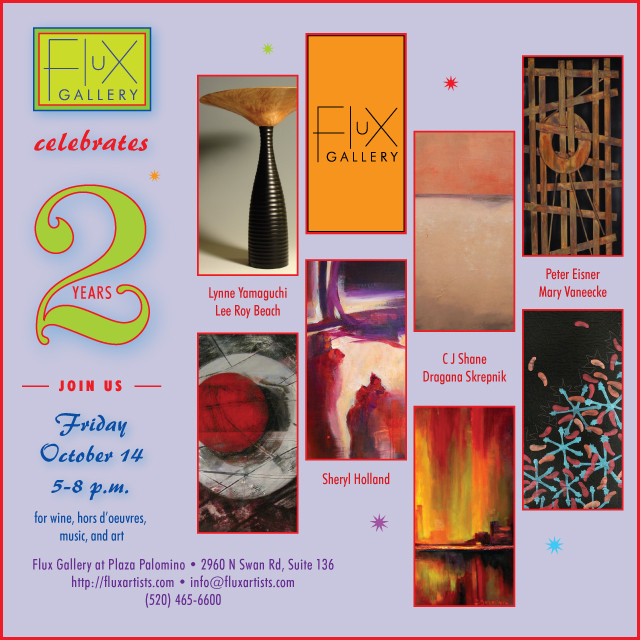 Celebrate with holiday music, wine, appetizers, desserts, and good friends! Enjoy the camaraderie of friends new and old. Area resorts have also donated silent auction items including their signature gift items, a one-night stay, and spa privileges. Cost is $50/person ($35 membership included with the purchase of two tickets). Please help us celebrate our first successful year of managing the operations of the Center without City support. We’re on our own! Your continued support is vital to helping us sustain and grow this beautiful and vital community asset. The Shemer will be open to the public Tuesday through Saturday from 10 a.m. to 3 p.m., Sunday afternoons from 12 noon to 3 p.m., and Thursday evenings from 6:30 to 8:30 p.m. Stop by if you can! The Arizona Daily Star featured a story on me on Friday, August 12; read it here. Reporter Patty Machelor interviewed me and spoke to a few of my collectors for the story, and photographer Benny Sanders took some shots of me in my studio (be sure to click on the Image tag above the story to see them all). Yes, I know this post is way late, but what can I say? I was on vacation when the article came out.